It was Spring and my paternal grandmother Victoria Seekamp decided it was a good day to burn leaves. And perhaps a little brush. She was 72 and was babysitting her 6 year old granddaughter, my cousin Kelly, out in the well kept backyard of the oldest house in the village of Goshen, NY. It was built in 1732 and purchased by her and her late husband, my grandfather John H. Seekamp, and their oldest daughter, my aunt Dorothy (Dot), in 1956. On this Monday afternoon, Kelly’s mother, my aunt Rita, was probably at work, as was my aunt Dot, so Kelly was there alone with our shared grandmother. There was a mild wind blowing in from the west, but having already deciding to burn, Grandma Seekamp pressed on. She raked, and raked, forming piles as she went about the chore. Then with one match she got the first pile going. She watched as the flames grew and the smoke billowed. Then she raked some more and then lighted more piles. Kelly watched at first, then continued the running about she had started earlier. Our grandmother looked up at her briefly and then raked some more, now raking along the edge of the mowed lawn, where the back field started. There she built a big pile. She lit that pile, then walked back to the one first lit. As she tidied it some, she glanced back at the pile near the edge. The flames had jumped from it, and the unkempt part of the property, full of dry leaves and grasses, was now burning. She walked over to that area quickly and began hitting the wayward flames with the rake, but that made it worse. Kelly, unaware at first that the fire was out of control, looked over and saw the smoke and flames, and the panic on Grandma’s face. “Just dial O for the operator and tell her you need to call the fire department, Kelly,” our grandmother shouted. “Okay,” Kelly shouted again. then once again she ran. She disappeared into the house as our grandma began raking the out of control burnings. Then, having already talked to the operator, Kelly held the phone and waited and not long after that the fire dispatcher picked up. “Goshen Fire Department,” he said. “The yard is on fire and we can’t put it out!” Kelly said. “Where do live?” the fireman asked. “In Hambletonian Park,” Kelly answered. Hambletonian Park, where Kelly lived, was a small sub division off Craigville Road. The only problem was she was calling from our grandmother’s house and it was at the far end of Main Street, heading out of the village. It was located about a mile from where the dispatcher sent the fire trucks, and though the firemen would be taking Main Street to get to Hamiltonian Park, they would be unaware of where the fire was actually burning, as they would be taking a right onto a side road, Craigville road, about a half mile before our grandmother’s house. Kelly ran back out and watched as Grandma Seekamp battled the flames. First our grandmother and Kelly heard the fire whistle blowing. Then they heard the sirens. Then, as the sirens no longer grew louder, they became fainter. Then they couldn’t hear the them anymore. Fortunately, our seventy two year old grandmother beat down the flames, taming them down to a smolder. After that she doused the remnants with buckets of water from the hose she usually used to water her plantings. When the fireman finally arrived my grandmother was sitting on a bench in the shade of her backyard keeping vigil in case the flames revived. The story got out somehow, and later that afternoon a photographer from the local newspaper came around. A photo was taken and the story was written on note paper. 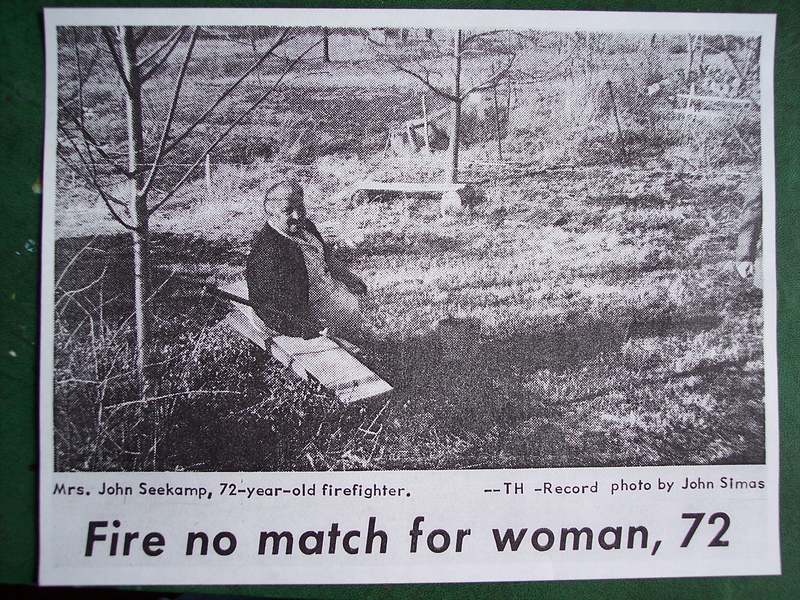 The next day the caption of the story under that printed photo read: ““Fire No Match For Woman, 72.” Perhaps to others that was so. But to Kelly and the rest of us grandchildren, that fire was no match for Gramma!